Leicester City players have arrived in Thailand for the funeral of the club's owner, who died in a helicopter crash. Jamie Vardy and club captain Wes Morgan are among the players attending Vichai Srivaddhanaprabha's funeral in Bangkok for the next two days. It began at a temple on Saturday with Buddhist bathing rituals, and will be followed by recitation ceremonies. The helicopter crashed after taking off from the club's stadium on 27 October, killing Mr Vichai and four others. They will join Buddhist prayers for Mr Vichai on Sunday and Monday before heading back to the UK to prepare for their home match against Burnley on Saturday. England defender Harry Maguire and manager Claude Puel are also among those who have travelled but a few players have not come, including Demarai Gray, who scored the winning goal at Cardiff. Who was Leicester's billionaire owner? Many of the squad, including Vardy, Morgan, and goalkeeper Kasper Schmeichel, have spoken of the huge impact the Thai billionaire had on them and the club. 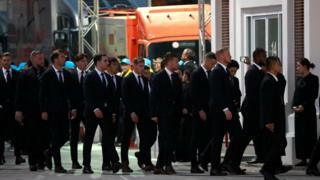 Jonathan Head, the BBC's South East Asia correspondent, said: "This is a more formal atmosphere than the players will have experienced during the moving tributes to Mr Vichai in Britain. "But it is their last farewell to him, and will doubtless be an emotional occasion for them." Nusara Suknamai, Kaveporn Punpare, pilot Eric Swaffer and his partner, Izabela Roza Lechowicz, also died in the crash at the King Power Stadium. Ms Nusara's funeral took place in Bangkok on Saturday. The 32-year-old, who was a member of Mr Vichai's staff, was a runner-up in Miss Thailand Universe in 2005, where she was listed as being from Bangkok province. The Air Accidents Investigation Branch (AAIB) is conducting a probe into the cause of the crash.